Upon viewing this, I thought I remembered that the caloric content of booze is mainly the alcohol – that alcohol actually metabolizes like most sugars. 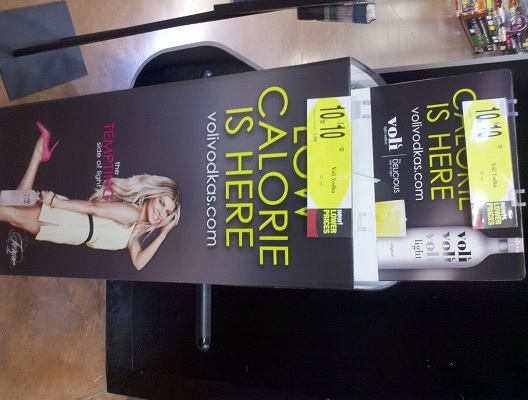 So I checked – and, yes, this booze has 25% less calories than regular 80 proof vodka, because this is 60 proof vodka. Do not try this at home. These are trained marketing professionals. I’m trying this new blogging platform. I’m not sure if it’s going to work – I am amazed at how slow the editor is. I type several letters and then wait for the editing window to backfill what I’ve typed. But if it takes a while for the Chinese comment spammers to find it, then it’s worth it. I am certain that some folks must actually look at some crappy spam content and see the link to BuyNewShoozFromShanghai.com and clidk the darn thing. At least one in a milion. And that seems to be enough to keep the spammers in business. But, even if it doesn’t, this is – after all – a diary. I keep forgetting that. The truth is that I have lost any public platform. I left FaceBook several months back, because I got tired of the political partisans calling the other political partisans stupid. Then, after over twenty years as an active member of the Dead Runners Society, I got tired of the partisans there taking any opportunity to find some way around the “don’t discuss politics here” rule. Since this is my blog, and nobody is reading the darn thing, I’ll say it out loud – it was the lefties who were doing that. I’ve come to believe that liberals really have to have some conservatives around to be liberal for. It’s no fun just being a liberal around other liberals. I was also in a Big Book study group, but I left that one as well, because I kept trying to start discussions about the material, but no discussions got started. And I already have a Big Book to read by myself. And then, spammers kilt my blog. Okay, they didn’t stop me from writing, but they did stop anyone from commenting. And suddenly I realized that I had no way to talk to anybody other than via one-on-one communications, either verbal or via email. And it’s only now that I realize that it’s weird that I think that that’s weird. Why would a guy like me ever have any way to talk to more than one person at a time, anyway? So we’ll see if this works. How can she drink that booze and stand there like that? I can’t even stand like that SOBER! Something tells me that you did NOT get here through proper channels. Is your visa stamped? I hate politicians. The only difference is that I am disappointed when “our” politicians act like all politicians whereas I can say “I told you so” when the other side’s do. That’s probably true regardless of which side “ours” is. If you don’t follow the news, you don’t know what ANYBODY’s politicians are doing – unless somebody runs up into your face and tells you in all-caps. Funny – now, sitting here, I can’t remember waht that verdict WAS…. a) An eight year old kid from Gary, Indiana who sang “Rockin’ Robin”. b) To be honest, it might be because he was a “celebrity”. Jimbo, love to read about your skiing and other exploits. Greetings from the other side of the mountains, in Denver. You must not make ultimatums! Glad to see you are back and hope this site works well for you. Hey, Spurrier’s not as smarmy now. Maybe I can change, too. Found you! (OK, followed you from the other FCtA). Maybe you can come back to DRS after November. But I find I’m deleting as many or more posts as I read there. I’ve been very close to going nomail on DRS again and the only thing that keeps me from dropping FB is to keep up with some family members. I can’t seem to bring myself to “unfriend” the non-family heavy posters but I did learn to drop them from the feed so that helps. Hang in there! I’ve thought about going back to FB and doing just that – cutting things back to “folks whom I know who aren’t seeing if they can make folks mad”. 2) It leaves me with more time. DRS? I realized that anything I said in there that had to do with running rarely garnered a response. It would simply fall into the bit bucket. Sometimes it seemed to me that I was a failed producer – John Galt would never come to tell me to stop, because my efforts weren’t working anyway. Glad you found a place to continue your blog. I look forward to reading every post. We miss you on DRS but I understand why you left. Good to hear from you – was just thinking a couple of days back that I was going to have to email you and see how you’ve been. Hi, I’ve been missing your blog so glad you are back at it. domain on godaddy (believe it or not). and I didn’t add much anyway. are of similar philosophical persuasion so I don’t run into too much trouble. Have been on wordpress for 18 months now and still only 1 spam every week or so. not bad.